As amazing as a Mac laptop or computer can be, they do still have their share of issues. 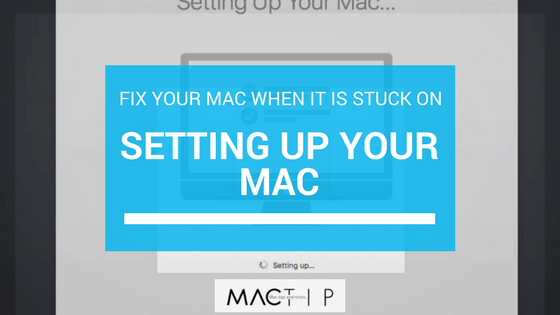 Sadly, there have been multiple instances of users having their mac get stuck on the “Setting Up Your Mac” screen. If it freezes or becomes unresponsive, no need to fret! As frustrating as it may be in the moment, it is no reason to get rid of your mac or freak out, because there are ways to solve it. In this article I will help you get your Mac working properly again so you can continue doing what you need to do or checking your social media. When users have talked about the issue, they state that, before the freezing, they were able to update their Macs with absolutely no problem. Their computers worked completely fine at first. It was not until the end of the OS X Update that they began to stop working correctly. You need the update, so as long as you know how to fix it then everything is alright. If you have a MacBook that has a removable battery, then here are the steps that you need to take to fix the frozen screen. Completely shut off your mac. If it is plugged in, then disconnect the power source. Completely take out the battery. While the battery is still out, press the power button on the device and hold it for about five seconds. Put the battery back into your Mac. Reconnect the power source/charger and then proceed to turn on your device. I know that may seem like a lot, but after those steps the device should continue running smoothly. There should be no more issues with the frozen set-up screen and the update should be working. Tip #2: There Is No Removable Battery? Don’t Worry! CONNECT the device to the power source. This step is different than the first one. While the device is still powered down, press and hold the Shift, Control, Option, and the Power buttons at the exact same time. Turn on your device and enjoy the new update! For this one, you have to ensure that it is plugged into the power source, and hold all of the buttons mentioned, and it should work. It sounds simple, but it has been proven to help. Unplug the Mac from the power source. Wait about 15 seconds before plugging the device back into the power source. After the device has been turned back on, it should be working fine. While I did say that these tips have been used by others and are proven effective, there could always be the odd device that refuses to listen. If that is the case, then contact Mac support and see what they can do, because there may be more to the issue. Hopefully this has helped you finish updating and setting up your Mac. I’m trying to reset a mac desktop to factory settings and it started off fine, rebooting a bunch of times and everything, then it appeared to be “frozen” and it’s been that way for about 4 hours. Should I unplug it and try again or continue waiting? Thanks in advance.